The guns that were allegedly found in possession of three males, including a 16-year old boy and a 65-year old man, at a house at Sophia. A 16-year old armed robbery suspect, who escaped from police custody, was arrested Sunday and handed over to police by his mother, the Guyana Police Force said. “Prompt and spirited action by residents of Sophia, has led to the recapture of a 16 year old fugitive, who escaped from lawful custody at the Cove and John Police Station today Sunday April 08, 2018,” police said. An initial report, according to police, indicates that he was taken out of the lockups to use the washroom and sometime after he was discovered missing, which resulted in an intensive search being launched. The fugitive was subsequently handed over to Commander ‘C’ Division Senior Superintendent Edmond Cooper in the presence of Crime Chief Assistant Commissioner Paul Williams by his mother at her residence about 10 AM Sunday. 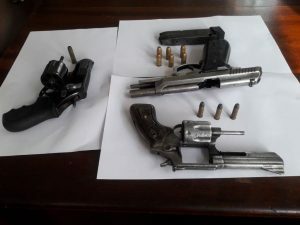 The teenager, a 65-year old man and another man were held for allegedly being in possession of three handguns and ammunition. The boy is also a suspect in an armed robbery that occurred last Thursday night at Sophia.